"Creativity is just connecting things" said Steve Jobs. It is that "Aha" moment which inspires it's auteur to forge on with an idea; in the case of these two individuals it involves the repurposing of an object or concept. The result is wearable art. In very different ways, these two designers have accomplished this feat; designing fashion accessories as a byproduct of other driving forces. When Austin Palmer-Smith opens the door to his studio apartment my first thought is that he is on the wrong coast. 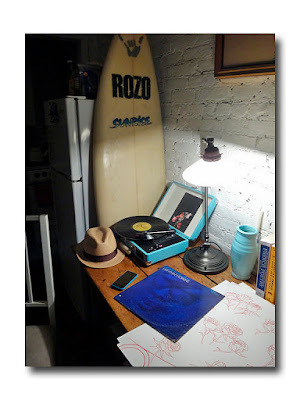 His Cali boy looks and laid back demeanor not to mention the surf board propped against the wall in the incense filled room, belie his NYC roots. On the record player is an old blues album ("Something Blue" by Lightnin' Hopkins to be exact, perfect for this rainy dismal day). On the desk are strewn watercolor mock ups of artwork for the silk scarves in his "Trumpets & Cherries" collection. The whimsical name refers to the hardness and the softness or the Yin and Yang. "The cherries could very well be the notes on a colorful ledger coming from the trumpet,"(an instrument he has played since grade school) he explains. Palmer-Smith created Trumpets & Cherries about a year and a half ago after a 10-year career painting murals commercially for many of the high profile buildings both domestically and internationally. Eventually finding the art world too "static and predictable" he began to lean towards the world of fashion (which, I might add, judging by all the high-profile designer defections in recent days is neither of those two things). Born in Paris, the son of a fashion photographer father and fashion model mother, you could say it was in his blood and virtually destined. Of course his background in mural painting has not totally gone by the wayside. His method of creating patterns includes painting a watercolor mural, often with a floral motif ("I like flowers. Buddha held a flower") and eventually shrinking it down to its essence working very organically while seeing which parts of the composition "come alive and speak to me." 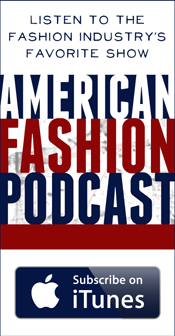 Like most fashion people, he is a stickler for detail and quality -- he points out a few production pieces (they are produced in China) that he considers defective since they were not made with the specified color edged rolled hem. He gives me a few from the approved pile to try. He drapes one with a more geometric pattern on himself as well. 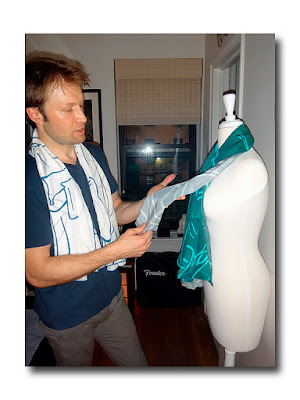 "I'd like to make scarves for men" he tells me. 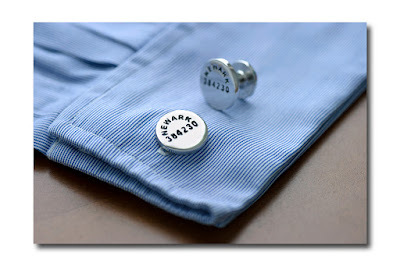 I mention that everything in fashion is leaning towards the unisex, so why not? 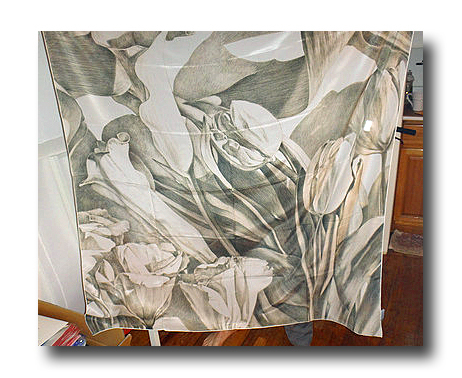 The scarves are large and of a thick silk with names such as "Float," "Flower Lady" and "Melange," range from $225 to $240 and are available on his website trumpetsandcherries.com as well as at various art fairs and boutiques. Next up: he's working on getting them into Bergdorf Goodman. 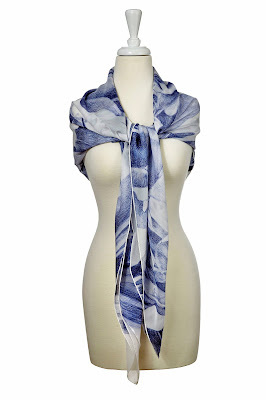 I always think that it's a shame that due to the nature of scarves being worn folded, one can never fully appreciate all that goes into the artwork yet the Zen-like designer doesn't seem to have a problem with that concept. I depart but not before I am given a very beautiful gift: a melange sand scarf which Austin feels best compliments my OOTD. Jessica Mindich of Greenwich, Connecticut is a former lawyer who quite literally made a creative connection between the Book of Isaiah's passage "let them beat swords into ploughshares" by melting down guns and shell casings to make jewelry. 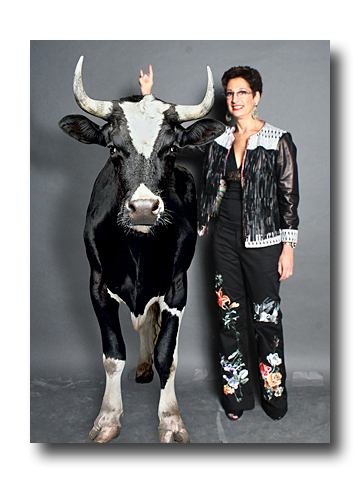 The Caliber Collection (calibercollection.com) was formed in 2012 (so named because it uses gun calibers while raising the caliber of the city by helping to get illegal guns off the street) evolved out of the original philanthropic company that she founded in 2008; Jewelry For a Cause. Mindich got this idea while attending a conference at which then Mayor of Newark Cory Booker spoke of the gun violence in his city. Booker mentioned that the city's gun buyback and amnesty program was out of funds and that they had several hundred weapons collected from crime scenes which they didn't know what to do with. She decided to give her concept a "shot" and spent 10 months collaborating with Booker and the Newark Police Department, developing their plan of attack. Mindich figured out that by using the guns to make jewelry and donating 20% of the proceeds she could help fund the buyback program. She has since partnered with other cities including Detroit, Hartford and the San Francisco Bay Area, creating jewelry exclusives named after each city. Today they have customers in over 83 countries. According to the website they have collected over 1,000 guns while raising approximately $100,000 for the police departments in their adopted cities. The Caliber Collection is carried by Selfridges UK, American Rag, Canvas Malibu, The Detroit Institute of the Arts and Urban Zen in New York as well as online retailers such as AHA Life and Amazon and of course on calibercollection.com. 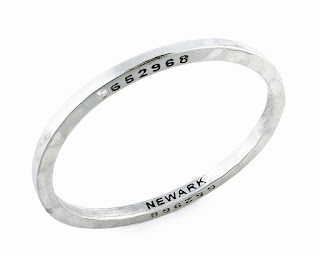 The popular Newark designs are made of brass or steel metal oval shaped bangles and cuffs "like the trigger cage of a gun. If you put your finger in the trigger cage you cause damage. But when you put the Caliber Collection through your hand you become part of the positive change and are participating in a virtuous cycle to get more illegal guns off the streets," explains Mindich. Each bracelet has a serial number incorporated into its design; one which comes from a gun that has been "Destroyed. Never to Destroy Again." The side of the bracelets are hand hammered "symbolizing the hard work of everyone in the community that is needed to deal with this issue" while the top of the bracelet is smooth and shiny to commemorate the feeling of a community without illegal gun violence. The design is sleek and similar to the Cartier Love bracelet which has recently had a resurgence in popularity with celebs such as Kylie Jenner wearing them by the wrist full. The Newark bracelets look great stacked as well and you get much more "bang for your buck" at $160 for a steel cuff to $375 for a bangle with diamonds. The Detroit "D" cuff (which reminds me of a more elevated, rapper version of a POW-MIA bracelet, if you're old enough to remember those), pays homage to the incredible music roots of the city while the Pittsburg, California line has a "coal" finish to reflect their rich coal mining history. Unfortunately, when those jobs left it paved the way for crime, gangs and guns to move in. Caliber Collection was recently mentioned in the Huffington Post as one of the top four jewelry companies that give back (see article), The New York Times (see article) as well as O Magazine, Crain's, People and InStyle. 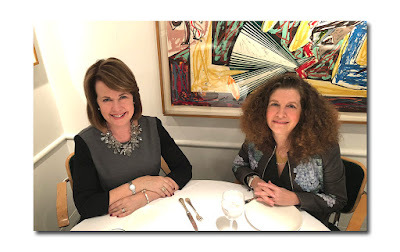 I also noticed that Mindich had lunch at Michael's with none other than our Entertainment Editor Diane Clehane last December for her Wednesdays at Michaels Column . And now for the "smoking gun" hot off the press news: Home decor in the form of lighting has just been added in a collaboration with Joseph Jeup to benefit the city of Detroit. 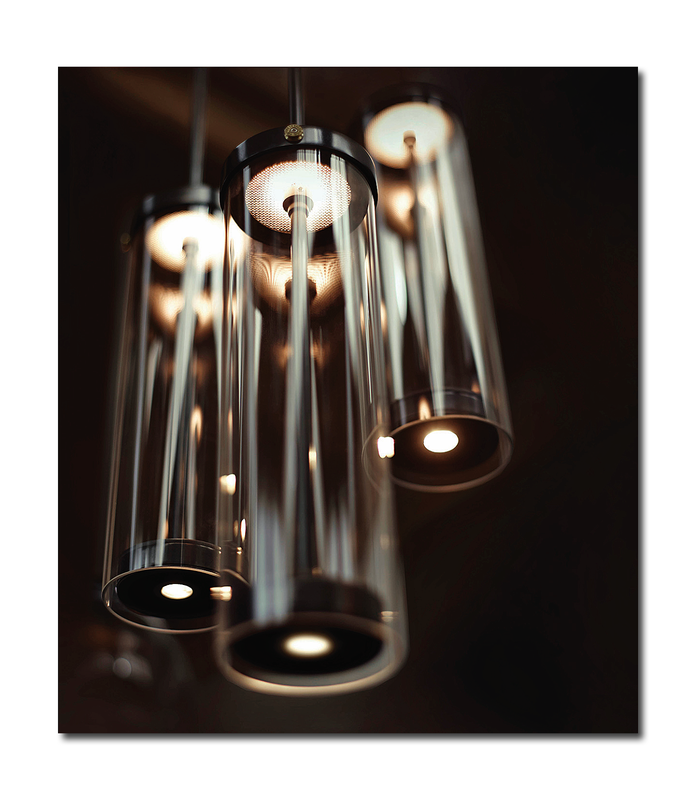 You can check out the brand new floor and hanging lamps on the website, each with their own gun serial number. Actual intact shell casings are used decoratively in the design making them unique and individual. The Caliber Collection will be bringing a trunk show to Urban Zen sometime closer to the holidays meanwhile if you'd like to order from www.calibercollection.com website use the code THANKYOU15 to save 15% on your purchase.